Unlike the relatively obvious notifications and comments features I’ve added in the last month or so, here’s a little addition I made last weekend that you may not have noticed. Take a look at the screenshot to the right: notice anything different? Yeah, that little back arrow in green and white (highlighted in the screenshot with a red box around it) is what I’m talking about. You’ll see this new icon at the bottom of every branch or chapter of a story (i.e. anything past the first page of the story.) That little icon pops up a modal (shown below) which lets you jump back to any previous branch or chapter of the story you’re ready. Handy, eh? I added this based on your feedback — I had several people contact me via email or on my profile suggesting it, so here you are. The previous story fragments will show up in descending order — the newest one will be at the top, and the oldest at the bottom. 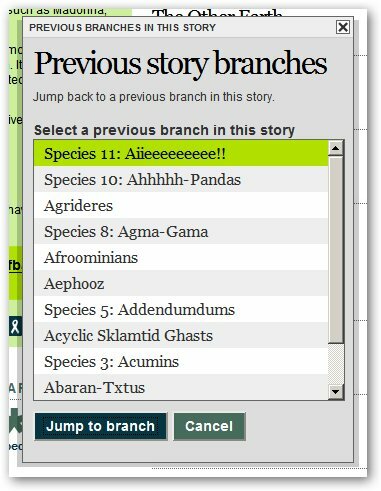 This gives you an at-a-glance view of where you’re at in the story’s tree or storyline, and by selecting a chapter or branch and clicking the “Jump to…” button, you’ll be taken back to that fragment. No need to keep hitting that “Back to previous branch” button at the top of the story heading anymore, unless you just want to hop back one page. As I’ve mentioned several times to various members who’ve asked, I do take all feedback seriously. Everything that I see asked for repeatedly gets added to my to-do list unless it doesn’t work with my plans for the site, so if you have an idea or suggestion that would improve your experience on the site, please feel free to contact me directly, or post a comment on my profile. I try and respond to every email I get from Protagonize members, so don’t be shy. This entry was posted in General and tagged branches, chapters, Features, howto, navigation, reading, reference, tutorials, updates. Bookmark the permalink.